Joshimath nestles in the Himalayas at a height of 6150 feet above sea level, enroute to Badrinath from Rishikesh. There are temples to Narasimha and Vasudeva, built by Adi Sankaracharya here. Joshimath, is the first mutt established by Shri Adi Sankara, and is located at a distance of 14 kms from Helang enroute to Badrinath. Adi Sankara authored Sri Sankara Bhashyam here . In the temple for Narasimha , is enshrined Badrinarayan along with a pantheon of deities. The presiding deity Lord Narasimha is believed to have been established by Adi Sankara. Joshimutt is surrounded on three sides by the snow clad Trishul (7250m) in the south, Badri Peaks (7100 m) in the NW, and Kamet (7750m) in the north. Tirumangaialwar has sung in ten verses of Vishnu (Rama) at Tiruppirudi. Tirumangaialwar refers to Vishnu as Rama, Krishna and as 'Paraman' reclining on the thousand headed serpent. It is widely interpreted that Tirumangaialwar has sung of Vasudeva here. Another school of thought holds that Nandaprayag - the confluence of rivers Nandakini and Alaknanda. situated at a distance of 190 kms from Rishikesh. is Tiruppirudi.There is a temple to Gopala at Nandaprayag. Pilgrims visiting Divya Desams visit both the temples. Theertham - Indra Theertham, Govardana Theertham, Maanasasaras. About 160 miles from Haridwar.About 18 miles from Badrinath. A Narasimha Saligram is available for darshan at Sankara Mutt. Legends and hearsay differ drastically. The Moolavar of this sthalam is Paramapurushan. He is found in Kidantha kolam in Bujangha sayanam facing his thirumugham towards east direction. 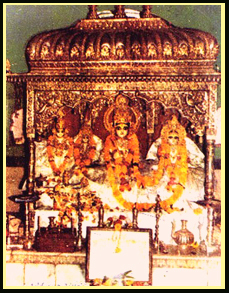 Prathyaksham for Parvathi devi. This Divyadesam is found around 154 kms away from Haridwar, while travelling from Devaprayag to Badrinath. There is no firm agreement on the where this Divyadesam is situated. Many of the pilgimage believe that Joshimutt is the Divyadesam which is called as "Thiruppirudhi" and some say that Thiruppirudhi is found in the interior of Himalaya.